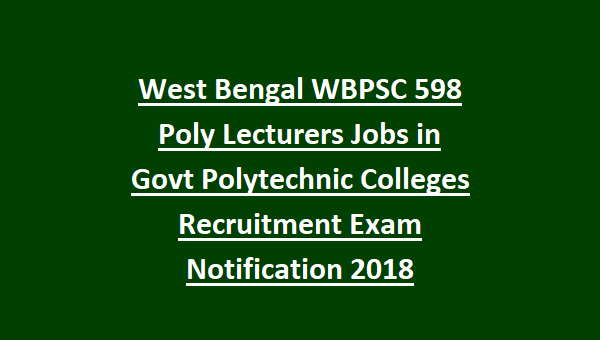 West Bengal WBPSC 598 Poly Lecturers Jobs in Govt Polytechnic Colleges Recruitment Exam Notification 2018-WBPSC Polytechnic Lecturer Vacancy Recruitment Syllabus, WBPSC West Bengal Technical Education Department, Govt Polytechnic Colleges Lecturers Jobs Recruitment Exam Notification 2018 Apply Online, Lecturers Jobs in Government Polytechnic Colleges of West Bengal WBPSC LT Grade Teacher Recruitment Exam 2018 Notification, Most vacancies are in the subjects of Computer Science & Technology, Electrical, Mechanical, Humanities Electronics, Civil Chemical, Maths, Physics, Chemistry and Metallurgical/Chemical Engineering. Technical Education Department of West Bengal State. For WBPSC Polytechnic Lecturer Recruitment 2018 candidates must be a Engineering/Technology Graduate and Bengal Speaking, Reading and Writing knowledge. For WBPSC Polytechnic Colleges Engineering Lecturer Jobs candidates must have completed B.E or B.Tech and for Non Engineering Subjects M.Sc or PG qualification is required. Total 598 Polytechnic Lecturer vacancies are in 23 subjects of WBPSC Polytechnic Lecturer Recruitment 2018. WBPSC is recruiting this lecturer jobs to fill the available vacancies in Government Polytechnic Colleges of West Bengal State. Selection for WBPSC Polytechnic Lecturer Vacancy Recruitment will be through Written Test /Screening Test and personal interview. Last date for submission of online application form for this WBPSC Govt Polytechnic Colleges Lecturer Jobs is 13-08-2018. For more details regarding West Bengal PSC Polytechnic Lecturers Jobs of Technical Education Dept Govt Polytechnic Colleges subject wise vacancies, selection process, qualification, age limits, how to apply online and more details are given below. Most vacancies are in the subjects of Computer Science & Technology, Electrical, Mechanical, Humanities Electronics, Civil Chemical, Maths, Physics, Chemistry and Metallurgical/Chemical Engineering. Vacancy Notification for WBPSC Lecturers Jobs in Govt Polytechnic Colleges of Diploma Sector. 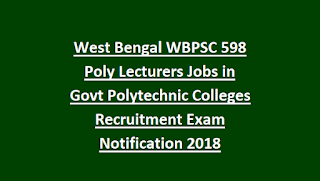 There are total 598 Polytechnic Lecturer vacancies available in this West Bengal PSC latest govt jobs recruitment of WBPSC Government Polytechnic Colleges of Technical Education Dept. Lecturer Electronics & Telecommunications Engg. For Lecturer Posts: 18-37 years as on 01-01-2018. For Polytechnic Lecturer Jobs in West Bengal Technical Education Dept Engineering Branches Candidate must have completed B.E or B.Tech with first class marks. Must have good knowledge in Bengali reading, writing and speaking skills. For Non Engineering Subjects Jobs-Candidates must have qualified M.Sc or its equivalent. For OBC/General Candidates Application/Exam fee is Rs.210/- and other charges are applicable as per the norms. For SC/ST candidates no application fee. The selection for WBPSC Polytechnic College Lectures Jobs is through Screening test/Written Exam and/or Interview. However interview will be conducted for shortlisted candidates through written exam or direct recruitment by WBPSC. Screening test dates are issued later by WBPSC after completion of online application process. Download Exam Pattern and Syllabus for WBPSC Govt Polytechnic Colleges Lecturer Jobs of Computer, Electrical, Mechanical, Humanities, Civil Engineering Electronics, Civil, Chemical Engineering, Maths, Physics, Chemistry Subjects PDF format. Exam Syllabus will be Diploma Level Only. To test the candidates knowledge WBPSC may ask your Degree Engineering or MSC level syllabus questions. WBPSC Lecturer posts online Application form will be available online from 24-07-2018 and last date is 13-08-2018. Submit application form online at WBPSC official website of @www.pscwbapplication.in.